Through December 21st, an experiment in audience-participatory art is live at the Museum of Contemporary Art in Roskilde, Denmark. Social Souvenir has 300 t-shirts on display for purchase. 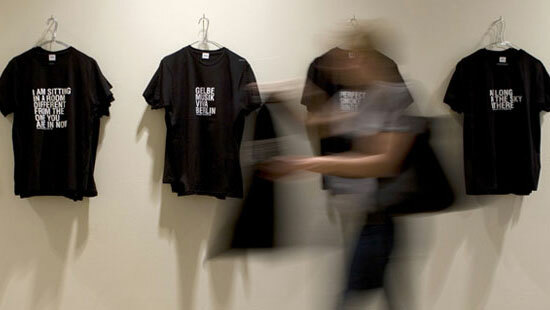 Each shirt includes a quote from one of fifteen renowned artists like Yoko Ono, Erik Satie and Marcel Duchamp. Once you purchase your shirt, you enter your name and location into a database, which adds your info to a Google map. As the shirts disappear from the gallery, the map grows. An interesting experiment in community-building and the use of new media.